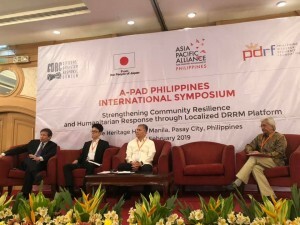 On February 28, in collaboration with Citizens’ Disaster Response Center (CDRC) and Philippine Disaster Resilience Foundation (PDRF), A-PAD Philippines held its third international symposium on “Strengthening Community Resilience and Humanitarian Response Through Localized DRRM Platform” in Manila. 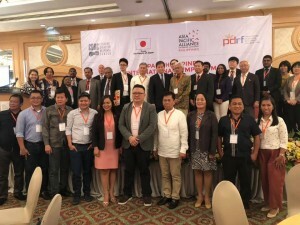 The symposium aimed to bring the representatives of the six Regional Platforms (RP) in the Philippines and A-PAD member representatives together to share best practices of A-PAD in building community resilience and leading effective humanitarian response at the local level. In the discussion sessions, representatives of the six A-PAD member countries, Bangladesh, Indonesia, Japan, Korea, Philippines and Sri Lanka presented the examples of best practices in multi-sector collaboration in emergency response, and activities of national platforms and discussed challenges in building up community resilience for disaster. Ms. Jazmin Jerusalem, a Board of Trustees at CDRC shared the process of establishing the six multi-sectoral collaborative Regional Platforms, A-PAD Davao, Bicol, Ilocos, Central Visayas, Eastern Visayas, and SOCCSKSRGEN, that can be the hub of coordination of DRRM in local areas. The Philippine Regional Platforms will be a show case for other member countries to emulate as they implement their own programs in local level. In the last session at the symposium, the representatives of the six A-PAD Philippines Regional Platforms and members of the National Coordinating Committee (NCC) agreed to participate in collaboration in DRRM and signed A-PAD Philippines Charter and Oath-taking. 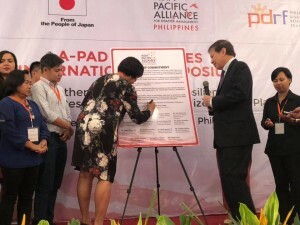 Supported by Ministry of Foreign Affairs of Japan (MoFA), A-PAD and A-PAD Philippines has implemented a disaster management capacity building project in the Philippines, and the symposium is one of the components of the project.